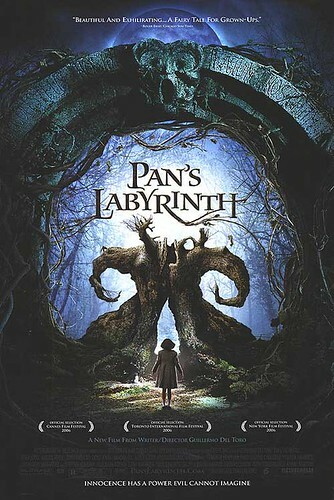 Pan’s Labyrinth is easily the best movie of 2006 that I have seen. As of now, I have not seen The Departed, The Queen, Letters from Iwo Jima, and Babel (I hope to see them all in the next two weeks), but I cannot imagine that any of them can top Guillermo del Toro‘s vision and filmmaking in this movie. Pan’s Labyrinth is, in a word, breathtaking. Set in 1944 in Franco’s Spain, Labyrinth is, as many critics have pointed out, an adult fairy tale. A young girl named Ofelia (brilliantly portrayed by Ivana Baquero) must cope with a world gone mad with the violence of war. This madness has reached into her own family since her mother has married a captain in Franco’s army, who is actively engaged in hunting down and killing rebel forces in the area around his home. The film deals with Ofelia’s way of coping with this and is tied to an ancient legend of a princess, a princess that just might be her. Though violent in some places, the film is a good one. I give this film 10 out of 10 stars. Posted on February 4, 2007 December 9, 2014 by WPosted in Movie ReviewTagged movie review, Pan's Labyrinth.